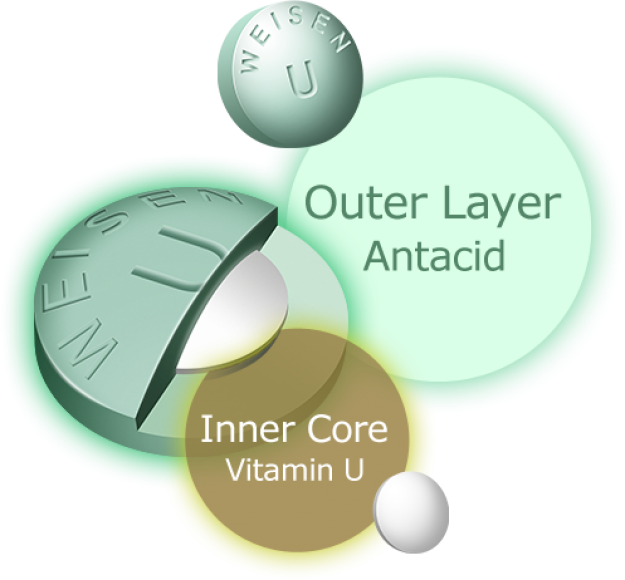 Developed as a gastrointestinal drug, each Weisen-U tablet features an innovative dual layer. As the two layers work in synergy, they can effectively soothe and heal upset stomach, heal damaged gastrointestinal mucosa and help maintain a healthy digestive system. Weisen-U contains powerful antacids that can neutralize gastric acid and relieve stomachache. Weisen-U contains biodiastase 2000 can promote the digestion and absorption of starch in the stomach, alleviating the load on the digestive system. The mucosal protective agents of Weisen-U can heal damaged gastrointestinal mucosa and speed up the recovery. Since 1958, Weisen-U has been the choice of people suffering from gastrointestinal problems in Hong Kong, Macau and Southeast Asia. In the 1970s, it launched in Europe and the Americas in the 1970s, Weisen-U extended its reach to China in the early 1980s and soon became a household name for its proven efficacy. Today, Weisen-U is one of the earliest imported gastrointestinal drugs in China. Kin Fung Weisen-U Co., Ltd.
7/F, Block 1, Yau Tong Industrial Building, 2 Shung Shun St., Yau Tong, Kowloon, Hong Kong. Copyright © Kin Fung Weisen-U Co. Ltd. All Rights Reserved.